William & Mary alumna and planetary geologist Ellen Stofan ’83 has been named NASA’s chief scientist, the organization announced today. According to a press release, Stofan will be NASA Administrator Charles Bolden's principal advisor on the agency's science programs and science-related strategic planning and investments, effective Aug. 25. "Ellen brings an extraordinary range of scientific research knowledge and planetary exploration experience to the chief scientist position," Bolden said in the release. "Her breadth of experience and familiarity with the agency will allow her to hit the ground running. We're fortunate to have her on our team." Stofan is currently the vice president of Proxemy Research in Maryland and an honorary professor at the University College London in England. Previously, she worked for NASA’s Jet Propulsion Laboratory in Pasadena, Calif., acting in a number of senior scientist positions, including chief scientist for NASA’s New Millennium Program and deputy project scientist for the Magellan Mission to Venus. Her research interests include the geology of the Earth, Venus, Mars and Titan, Saturn’s largest moon. She is an associate member of the Cassini Mission to Saturn Radar Team and a co-investigator on the Mars Express Mission's MARSIS sounder. Stofan was also principal investigator on the Titan Mare Explorer. She has received multiple awards throughout the years, including the Presidential Early Career Award for Scientists and Engineers, and she has published multiple papers, book chapters and books, including Planetology: Unlocking the Secrets of the Solar System with astronaut Tom Jones. 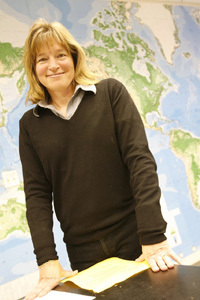 After receiving her Bachelor of Science degree in geology from William & Mary, Stofan earned her doctorate from Brown University. She is married to another William & Mary alumnus Timothy Dunn ‘83. The couple’s son, Ryan, graduated from William & Mary in 2010, and their daughter, Emily, is a current student in the Class of 2014.